Actually they have been for a while...oh the shame, I am so lazy! 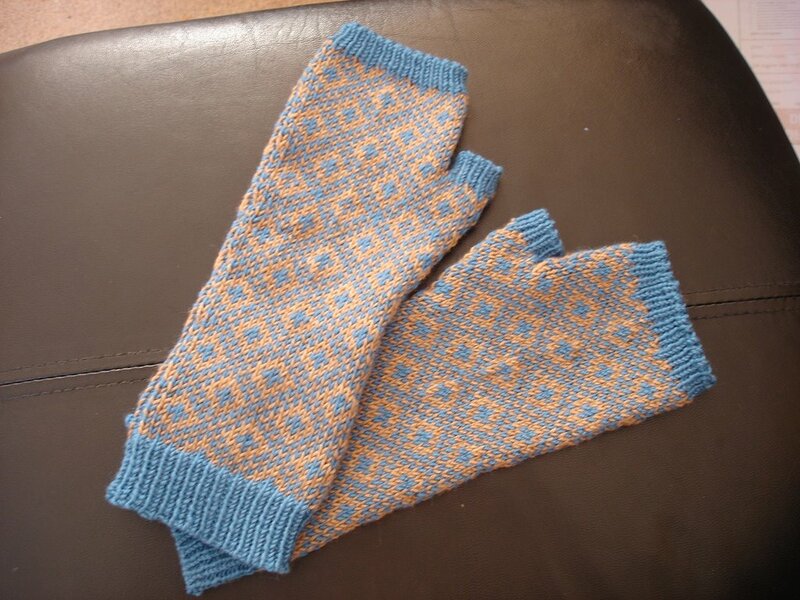 I LOVE this pattern, I have plans for a few more pairs of these too, then perhaps Eunny's mitts that she has just posted up as a pattern to buy, they are lovely. Back to these mitts though, well what can I say, what a lovely intro into the world of colourwork, it is going to be the start of a long standing love affair I think. Oh almost forgot to tell you.. I used Rowan 4ply soft to make mine, and 2.75mm needles, I felt they were a little loose so my next pair will be made on 2.5mm needles. Fantastic job! They are great. Cute, cute, cute! Your first colorwork project, you say? They look wonderful! thanks for your comments guys I love this pattern, I have another pair half complete but I cant show you any pictures as they are a present. Eunny I want to say a huge huge thanks to you, yu really inspire me to try new things and not be afraid! Your mitts are gorgeous and you should be proud of yourself, missus! Your mits look fab. I love the colourwork it's most impressive! Beautiful....great use of colour! Love the pattern. so jealous...i struggle so much with using more than one stand. Get in such a tangle! Lovely Cazza, just lovely. I am very tempted, but I must resist until after Christmas at least and I doubt my first attempt will look as good as yours, you're a natural babe! If you've got it, flaunt it!